The Deckmaster 2525E Electric Ride-On Floor Scraper is used primarily in areas requiring zero emissions and no fossil fuel-powered motors. The electric floor scraper removes VAT, vinyl asbestos tile and VCT, vinyl composite tile. Thin set removal, mastic and adhesive removal makes the 2525E and excellent choice for interior floor demolition equipment. The floor scraper blade can be replaced in less than one minute. Self-dicing carpet blades cut bonded carpet into small strips. Residual carpet and glue removal is then performed by longer and thicker scraper blades. Abatement of asbestos vinyl tile is a major industry using electric floor scrapers. The 220-volt single-phase power supply is easily found in most commercial buildings. Also for use with the Deckmaster 2525E Electric Floor Scraper, is the 948 Bearclaw coating-removal system attachment and can be equipped with diamond cutters to remove underlayment, waterproofing membrane and epoxy coatings; diamond segments can also be used for surface coating removal. The 24″ width and 1700 lbs. of weight, makes the Deckmaster 2525E an ideal machine to remove floor covering in high-rise office buildings, hallways, cafeterias, restaurants and libraries to name only a few applications. The absences of engine noise and removable weights for standard elevator access makes this unit the right choice for hotels, casinos, schools and other noise sensitive jobsites. 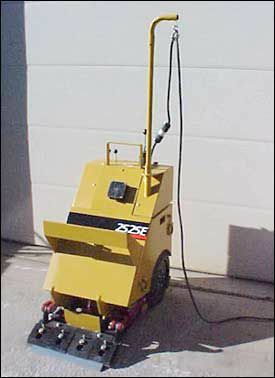 Unlike battery powered scrapers that lose power rapidly when scraping under heavy loads this electric floor scraper can run all day and night to assure job completion deadlines. The cord is kept out of the operator’s area with a swiveling cord outrigger mounted on the machine.